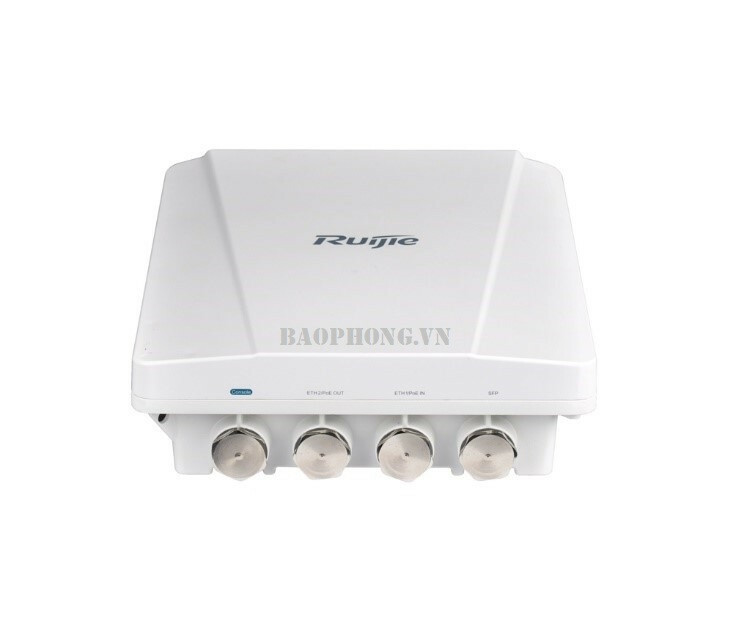 Bộ phát wifi ngoài trời Ruijie RG-AP630 | Outdoor Wireless Access Point » Tư vấn phủ sóng Wifi tại Huế giá rẻ. 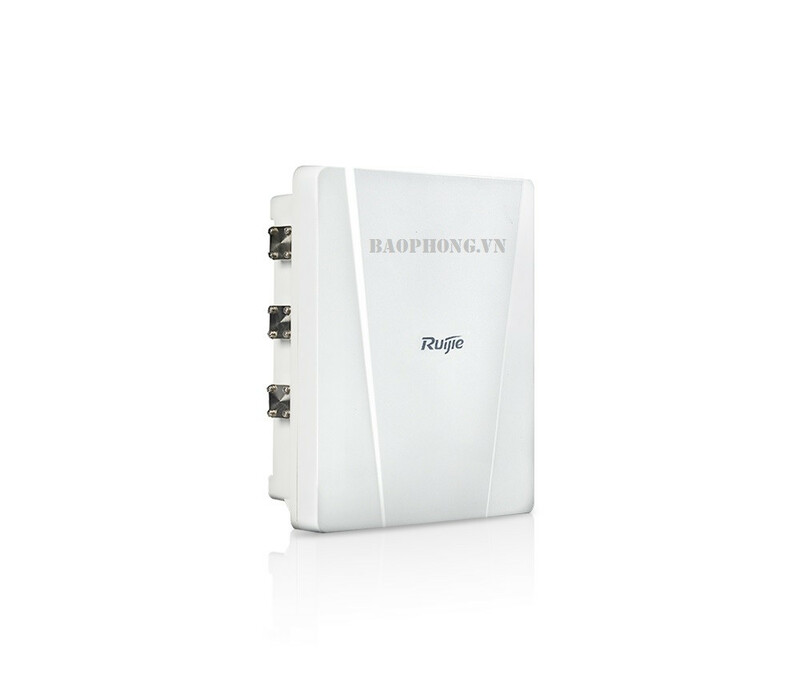 Ruijie RG-AP630 (IDA2) is Ruijie’s top-class 802.11ac Wave 2 wireless access points for next-gen high-speed wireless network applications. The RG-AP630(IDA2) supports 2.533Gbps access rate. The RG-AP630(IDA2) takes full care of security, RF control, mobile access, QoS, seamless roaming and other Wi-Fi aspects. Teaming up with Ruijie RG-WS Wireless Controller Series, the APs offer Wi-Fi user data forwarding, advanced security and access control with ease. The industrial-class AP enclosure (IP67 rated) can withstand extreme outdoor conditions and hence simplify device installation and maintenance. The RG-AP630(IDA2) is built-in with directional antenna An extensive collection of external antennas is also available to overcome various deployment challenges. The AP support automatic switching between the external and internal antennas. The RG-AP630(IDA2) supports 802.11n@2.4GHz and 802.11ac@5GHz, access rate up to 2.533Gbps. The outstanding wireless performance greatly optimizes wireless user experience, increases the number of concurrent users and enhances signal coverage. Equipped with built-in antenna, the RG-AP630(IDA2) can achieve a real-time antenna beam switching based on the location of access devices, ensuring optimal wireless experience. The AP also support switching of internal and external antennas to flexibly adapt to any deployment scenarios. The RG-AP630(IDA2) offers a 10/100/1000Base-T Ethernet uplink port that rids the LAN port of being the wireless access bottleneck, and a 1000M SFP combo port that adapts to wired networking structure under different user scenarios. The SFP Base-X port takes up the data transmission workload for optimal network deployment. An adjustable mount-kit is available by default for painless deployment optimization. The APs can be easily adjusted -60° to 60° horizontally and -60° to 90° vertically to adapt to various scenarios. The RG-AP630(IDA2) Outdoor AP offers you a one-stop installation package. Everything you need is included, from external antennas to lightning arresters and coaxial cables, for effortless outdoor deployment. The APs implement WDS (Wireless Distribution System) to support interconnection of multiple APs or wireless bridging under 5 hops. Wireless bridging can be achieved even for a long distance. The outdoor APs also support point-to-multipoint bridging (CPE application scenarios) for more flexible networking. The features get over the outdoor deployment problems to support large-scale and remote high-speed wireless coverage. The APs support intelligent recognition of end devices running mainstream operating systems such as iOS and Android. Employing an industry-leading local forwarding technology, the APs eliminate the traffic bottleneck of wireless access controllers. Deploying with the Ruijie RG-WS Wireless Controller Series, users can flexibly pre-configure the data-forwarding mode of the outdoor APs. The APs also control if the data will be forwarded via the wireless controller. The local forwarding technology can forward large-scale, delay-sensitive, and real-time transmission data to greatly alleviate the traffic pressure on the wireless LAN controllers and fulfill the high traffic transmission requirements of the 802.11ac network. The APs team up with the RG-WS Wireless Controllers in perfect harmony, allowing wireless users to roam seamlessly on Layer 2 and Layer 3 networks without data interruption. The AP supports a wide range of QoS policies. For example, it provides WLAN/AP/STA-based bandwidth limitation modes that prioritize key services over others. The outdoor APs offer an IP67-rated enclosure that fulfills waterproof, dustproof, moisture-proof and flame retardant requirements to withstand harsh environments such as wind erosion, rain and high humidity. The features greatly lengthen the equipment life span and effectively reduce the maintenance cost. All the AP components and enclosures can withstand a wide temperature range from -40°C to 65°C without any influence on the stability and life span. The design ensures the metal components cool down efficiently at high temperatures. The built-in heater module guarantees stable operation under freezing conditions. The outdoor APs offer protected Wi-Fi access with the support of cutting-edge encryption technologies such as WEP, TKIP and AES, guaranteeing the data transmission security of the wireless network. With the virtual AP technology, the AP can offer up to 16 ESSIDs (per radio) and 16 802.1Q VLANs. The network administrator can separately encrypt and isolate subnets or VLANs that have the same SSID. A separate authentication mode and encryption mechanism for each SSID can also be configured flexibly. CAPWAP (Control and Provisioning of Wireless Access Points) enables communication between RG-WS Wireless Controllers and the outdoor APs. The standard ensures secure data transmission. In collaboration with Ruijie’s RG-SNC Smart Network Commander and RG-WS Wireless Controllers, the APs enable the RF probe scanning mechanism to detect unauthorized access points or other RF interference sources. Once detected, the APs will alert network administrator to monitor potential threats and usage status in the wireless environment. Together with Ruijie’s RG-SNC Smart Network Commander and RG-WS Wireless Controllers, the APs provide a powerful range of wireless security features such as Wireless Intrusion Detection System (WIDS), RF Interference Location, Rogue AP Countermeasures, Anti-ARP Spoofing and DHCP protection for a truly secure and reliable wireless network. Comprehensive IPv6 features are available to enable IPv6 forwarding on a wireless network. Both IPv4 and IPv6 users can connect to the ACs over tunnels, enabling IPv6 applications to be borne on the wireless network. The APs support flexible switching over the FAT and FIT modes according to the networking requirements of different industries. When there are few APs, users can adopt the FAT mode for easy independent network establishment. For large-scale networks, the APs can operate in FIT mode which allows centralized management of all the APs and other aspects such as security, traffic management, QoS and IP management when deployed with the RG-WS Wireless Controllers. Smooth transition from one to another, the APs fully protect user investment. Under the FIT mode, no AP configuration is required before deployment. Also, no manual configuration is necessary for on-site installation, maintenance or replacement. Auto-configuration can be completed via the AC. This user-friendly feature can greatly reduce workload and investment costs. The RG-WS Wireless Controllers or Cloud AC can remotely and centrally manage all AP operations such as channel, power ranking, SSID configuration, security configuration, VLAN division and so on. The feature enhances security and simplifies the wireless network management. The RG-AP630(IDA2) support the 802.3at PoE standard. By connecting to a HPoE switch through the AP Ethernet port, the outdoor APs can gain power and support data transmission via cables. The network administrator can remotely perform configuration. It also solves the problem of unstable power source, simplifies the installation process and maximizes the cost savings.